October 6, 1892 is the date in question. That’s when Alfred Lord Tennyson shuffled off this mortal coil, and although the Poet Laureate’s demise mostly lurks in the background of Penny Dreadful’s terrific third season premiere, it does serve a purpose. For one thing, it grounds the increasingly otherworldly happenings in a tangible reality (which may be especially important this season since, by the end of this episode, all of the “big three” of monster literature are in play). There’s also the sense, hinted at in Vanessa’s letter to Sir Malcolm, that a powerful light has gone out in London, allowing all the shadows of the underworld to slip in. As “The Day Tennyson Died” begins, Vanessa may be doubting the poet’s most famous line—the one about it being better to have loved and lost than never to have loved at all. She’s been left alone in Sir Malcolm’s mansion, and her circumstances are sketched in a handful of typically atmospheric shots: piles of mail at the door; full ashtrays and dirty dishes; cobwebs and buzzing flies. Who better to brighten this dismal mood than Ferdinand Lyle? He tells her of Tennyson’s demise and suggests she see one of these fancy new “mental doctors” about her depression, recommending one who helped him come to terms with his homosexuality. He doesn’t use such modern terminology, of course, but the gist is clear, as is Vanessa’s reaction to his visit although she doesn’t speak a word. As always, Eva Green’s face says it all, from Vanessa’s fear of moving on with life to her genuine affection and gratitude for Lyle stopping by. Vanessa is alone because, as you no doubt recall from last season’s finale, our main characters are now scattered around the globe. In my review of that episode, I expressed some concern about the plot contortions that might be necessary to bring everyone back together again. Now, however, I’m in no hurry to see that happen. 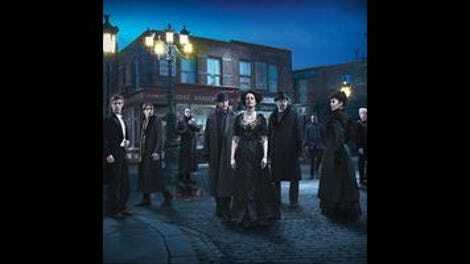 Writer John Logan and director Damon Thomas have vastly expanded the show’s scope, and what was already a lavish production is taken to new heights. What was once pure Gothic horror adds elements of the Western to its palette, and the narrative moves fluidly from London to Africa to the New Mexico Territory and the frozen Arctic as it catches up with (most of) our regular characters and introduces a few new ones. Sir Malcolm is drowning his sorrows in Zanzibar after burying Sembene and has no particular ambition beyond his next drink. When he is attacked by locals, an Apache named Kaetenay (Wes Studi) steps in to lend a hand (and claim a scalp or two). Kaetenay is also a long way from home, and their meeting is no coincidence: he wants Sir Malcolm to accompany him to America where “our son needs us.” That would be Ethan Chandler, now revealed as Ethan Lawrence Talbot and in the custody of a marshal and a slew of deputies (with Scotland Yard’s Rusk along for the ride). The train carrying him to his doom is boarded by a band of scruffy outlaws who wipe out all the lawmen save Rusk and his associate (thanks to a timely craving for tea) and liberate Ethan. They’re in the employ of Ethan’s father, and it appears he’s still a prisoner, one way or another. Shipwrecked on ice and surrounded by the starving and dying, John Clare begins to recover memories of his life before death and rebirth. While cradling a dying boy and singing a lullaby about guardian angels, he recalls a similar situation from his human life. He snaps the boy’s neck to end his suffering and heads out into the frozen wild for the longest walk home ever. Back in London, his creator is spending time with his old friend the needle when another old friend drops by for a visit. That Victor Frankenstein’s former college chum is Henry Jekyll could be cause for eye-rolling on a lesser show, but here his appearance just left me wondering what took him so long to show up. (One possible reason: In its early days, Penny Dreadful drew a lot of comparisons to The League Of Extraordinary Gentlemen, with some calling it a ripoff before it had even aired. Including another member of Alan Moore’s Victorian team-up would only have fanned the flames at the time, but now that the series has established its own world and mood, it would be weirder not to have Jekyll turn up.) Back in college, he and Frankenstein had planned to conquer death together—an ambitious goal that has led to some less than optimal results. Another major new character this season has a familiar face, as Vanessa notices to her shock when she follows through on Lyle’s advice and makes an appointment with alienist Dr. Seward, played by Patti LuPone. (Logan handwaves the fact that LuPone played the Cut-Wife last season with an acknowledgment that Seward is a distant relative, but it’s not like this sort of thing hasn’t been done before.) Seward is stern and seems to have Vanessa’s number, but taking to her seems to help; at least, Vanessa feels well enough afterward to take in a scorpion exhibit at the Museum of Natural History. What is perhaps more important than the alienist’s brusque manner is her literary pedigree. You may not immediately recall that Seward is the name of the insane asylum administrator in a certain famous Bram Stoker novel, but when you learn that her assistant’s name is Renfield, it seems only a matter of time before the shadowy Master of season one makes his return. Indeed, it happens sooner than I expected, and he speaks his name at last: Dracula. “The Day Tennyson Died” does suffer a bit from the season-premiere syndrome that afflicts most shows with an increasingly sprawling scope and cast of characters. The wheel has to keep spinning so the various storylines can be established, so there’s not much time to get in-depth with any particular character or situation. This is mostly table-setting, to be sure, but it’s an elegant table set for a tantalizing meal. “I love what you’ve done with the place.” We all knew Lyle was going to say it, yet it was still funny. Jekyll is played by Shazad Latif, who (per IMDb) is “of mixed English, Scottish, and Pakistani descent.” We don’t get the character’s full backstory yet, but it’s clear from the beginning that racism is something he’s dealt with on a regular basis. We didn’t catch up with everyone this week, as Lily and Dorian have yet to make an appearance. Lily is much on Frankenstein’s mind, however, especially once Jekyll offers his help in “domesticating” her. That should go well. 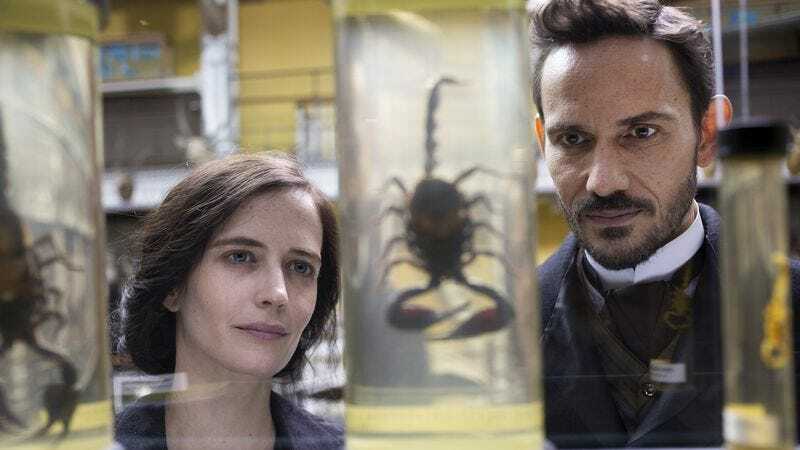 Penny Dreadful’s technical achievements continue to impress. One of my favorite moments in the episode was the cut between a bright, desolate desert landscape and the dark, crowded industrial harbor of London. Nicely done.